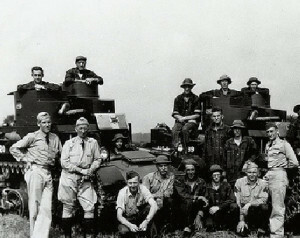 Kentucky Guard tankers in training: Members of Company D, 192nd Tank Battalion, Kentucky National Guard, pose with their vehicles at Ft. Knox, Ky., during the unit’s training prior to World War II. Called into federal service pursuant to the national emergency declared by President Franklin D. Roosevelt in 1940, the 192nd, along with the Guard’s 194th Tank Battalion, were deployed to reinforce the Army garrison of the Philippines. We recognize today (Dec. 7) as the 76th anniversary of the Japanese attack on Pearl Harbor in Hawaii and as the beginning of a long and hard military struggle for the United States and its allies. In terms of readiness for a war, the National Guard was a bellwether of the country and its citizens in December 1941. After Germany’s 1939 invasion of Poland, U.S. President Franklin D. Roosevelt had declared a state of national emergency to begin preparing for American involvement in what was increasingly becoming a global war. 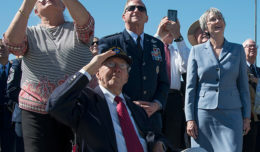 As part of this peacetime emergency measure, the entire National Guard — more than 300,000 soldiers — was ordered into federal service, with some units mobilized as early as September 1940. So when the Japanese attack came and war suddenly was inevitable, guardsmen were training in ground and air units all across the country. Moreover, because United States territories overseas were in desperate need of reinforcement, National Guard units had been deployed to augment the defenses of both Hawaii and the Philippine Islands well before Dec. 7. New Mexico Guard crew on duty in Philippines: A gun crew from the New Mexico National Guard’s 200th Coast Artillery Regiment poses with a 3-inch M2 anti-aircraft gun in the Philippine Islands in late 1941 or early 1942. 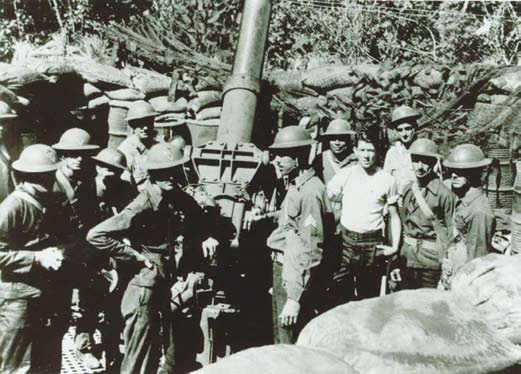 Guardsman were consequently in the thick of the fray during both attacks, claiming both the first Japanese prisoner of war at Pearl Harbor, by the 298th Infantry from Hawaii, and the first Japanese plane shot down in the Philippines, by the 200th Coast Artillery from New Mexico. By virtue of the peacetime mobilization, the National Guard increased the size of the Army, providing the War Department with trained, organized, and thus deployable units. 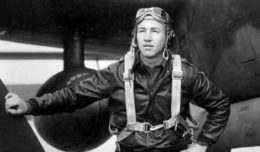 It also enabled the United States to almost immediately reassure beleaguered allies in both the Far East and in Europe with more than just words, but with actual American fighting men. A portent of the future, this token American military readiness, demonstrated through trained and ready units, inspired hope, both at home and abroad. On this day, we remember. The great loss of life in the line of duty on Dec. 7, 1941, compels the nation today, as it did then, to remember and to honor the sacrifice of those lost then, and to reaffirm its commitment to the men and women who defend the United States today.